For some, the dishwasher is simply a standard household appliance. Yet for others, the dishwasher is a time-saving blessing that helps with the stacking dishes. The fact that the use of dishwashers is increasing rapidly comes at no surprise. An automatic dishwasher helps with a multitude of occasions; when entertaining guests, after a big family meal, or simply to let you put your feet up after a busy day. It can't be argued why the dishwasher is now becoming a staple for most kitchens. Therefore, it can be very annoying when your trusty dishwasher suddenly stops working. For many people, this means a lot of hassle, going back to hand washing big loads, even expensive electrician bills, or starting to save for a new one. However, in many cases, it can be relatively simple and inexpensive to replace any broken parts. Fixing it yourself may seem scary with the perceived complexity of a dishwasher, but in actual fact, your appliance is actually quite simple. Replacing broken components of your dishwasher can sometimes really be worth the effort, and can result in you being able to get your dishwasher back to work without an expensive bill to pay. It doesn't always have to be a major mechanical component - such as a pump or motor - that can cause your dishwasher agro. Sometimes it can simply be the cutlery basket or the wheels of the loading cart. 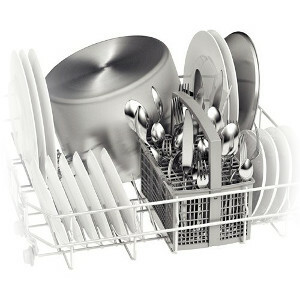 At Fiyo.co.uk we have a large selection of dishwasher parts assembled for your convenience, to help you get back on track with your daily chores. What Dishwasher Do You Have? In order to find the correct parts for your machine, it is important that you look up the type or model number of your dishwasher. You can usually find this number on the type plate which can be located on the inside of the dishwasher door, or all the way at the bottom (under the door, almost on the floor). It could even be located at the back of the machine. The model(type) number - NOT the serial number - usually consists of (a combination of) letters and/or numbers that are sometimes separated by a hyphen (-) or a slash (/). Once you find this number, simply enter it in the left column search bar on this page to reveal the parts compatible only with your machine.